In 1980 Fiorentina was bought by Flavio Pontello, from a rich house-builder family. He quickly changed the team's anthem and logo, leading to some complaints by the fans, but he started to bring in high-quality players such as Francesco Graziani and Eraldo Pecci from Torino, Daniel Bertoni from Sevilla, Daniele Massaro from Monza and a young Pietro Vierchowod from Sampdoria. The team was built around Giancarlo Antognoni, and in Serie A 1981-82 Fiorentina were involved in an exciting duel with rival Juventus. After a bad injury to Antognoni, the league title was decided on the final day of the season, when Fiorentina were denied a goal against Cagliari and were unable to win. Juventus won the title with a disputed penalty, and the rivalry between the two teams erupted. In 1990 Fiorentina fought to avoid relegation right up until the final day of the season, but did reach the UEFA Cup final, where they again faced Juventus. The Turin team won the trophy, but Fiorentina's tifosi once again had real cause for complaint: the second leg of the final was played in Avellino (Fiorentina's home ground was suspended), a city with a lot of Juventus' fans, and Roberto Baggio was sold to the rival team on the day of the final. Pontello, suffering from economic difficulties, was selling all the players and was forced to leave the club after serious riots in Florence's streets. The club was then acquired by the famous filmmaker Mario Cecchi Gori. The first season under Cecchi Gori's ownership was one of settling, after which the new chairman started to sign some good players like Brian Laudrup, Stefan Effenberg, Francesco Baiano and, most importantly, Gabriel Batistuta, who became an iconic player for the team during the 1990s. In 1993, however, Mario Cecchi Gori died and was succeeded as chairman by his son Vittorio Cecchi Gori. Despite a good start to the season, the Vittorio Cecchi Gori fired the coach after the defeat against Atalanta, Luigi Radice, and replaced him with Aldo Agroppi. The results were dreadful: Fiorentina fell into the bottom half of the standings and were relegated on the last day of the season. Claudio Ranieri was brought in as coach for the 93-94 season, and that year Fiorentina dominated Serie B (second division). Upon their return to Serie A, Ranieri put together a good team centred around new top scorer Batistuta, signing the young talent Rui Costa from Benfica and the new world champion Brazilian defender Marcio Santos. The former became an idol to Fiorentina fans, while the second disappointed and was sold after only a season. Viola finished the season in 10th. The following season Cecchi Gori bought other important players like Stefan Schwarz. The club again proved its mettle in cup competitions, winning the Coppa Italia against Atalanta, and finished joint 3rd in Serie A. In the summer, Fiorentina was the first non-national champion to win the Supercoppa Italiana, defeating AC Milan 2-1 at the San Siro. Fiorentina's 95-96 season was disappointing in the league, but they did reach the Cup Winners' Cup semi-final by beating Gloria Bistrita,Sparta Prague, and Benfica. The team lost the semi-final to the eventual winner of the competition, FC Barcelona (Away 1-1, Home 0-2). The season's main signings were Luís Oliveira and Andrei Kanchelskis, the latter of whom suffered a lot of injuries. At the end of the season, Ranieri left Fiorentina for Valencia CF, and Cecchi Gori appointed Alberto Malesani. Fiorentina played well but struggled against smaller teams, although they did manage to qualify for the UEFA Cup. Malesani left Fiorentina after only a season and was succeeded by Giovanni Trapattoni. With Trapattoni's expert guidance and Batistuta's goals, Fiorentina challenged for the title in 1998-99 but finished the season in third, earning them qualification for the UEFA Champions League. The following year was disappointing in Serie A, but Viola played some historical matches in Champions League, beating Arsenal 1-0 at the old Wembley Stadium and Manchester United 2-0 in Florence. They were ultimately eliminated in the second group stage. At the end of the season Trapattoni left the club and was replaced by Turkish coach Fatih Terim. 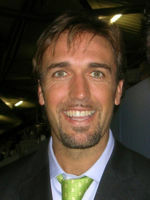 More significantly, however, Batistuta was sold to Roma, who eventually won the title the following year. Fiorentina played well in 2000-01 and stayed in the top half of Serie A, despite the resignation of Terim and the arrival of Roberto Mancini. They also won the Coppa Italia for the sixth and last time. 2001 heralded major changes for Fiorentina, as the terrible state of the club's finances was revealed: they were unable to pay wages and had debts of around USD 50 million. The club's owner, Vittorio Cecchi Gori, was able to raise some more money, but even this soon proved to be insufficient resources to sustain the club. Fiorentina were relegated at the end of the 2001-02 season and went into judicially controlled administration in June 2002. This form of bankruptcy (sports companies cannot exactly fail in this way in Italy, but they can suffer a similar procedure) meant that the club was refused a place in Serie B for the 2002-03 season, and as a result effectively ceased to exist.